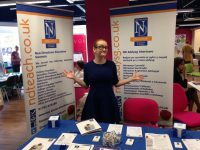 New Directions Education are preferred supplier of education staff for Swansea, Neath Port Talbot, Pembrokeshire and Ceredigion, offering supply, part-time and full-time positions to teachers and non-teaching staff. We work with a wide range of primary and secondary schools and colleges and are committed to achieving and maintaining the highest standards for cover within local schools. In 2012 we were awarded the All Wales Agreement for the provision of education staff across Wales, as a result we are preferred supplier to over 20 boroughs and local authorities. In 2012 we were also named as a ‘Hot 100’ Recruiter by Recruiter magazine. Over the last few weeks we have been holding recruitment days at a number of different venues to meet individuals who are looking for work in the education sector. We have attended the Pembrokeshire Jobs Fair and also visited Aberystwyth University. We have a number of recruitment days booked in over the summer, if you would like to find out more or if you would like to attend a recruitment day contact us by calling 01792 620180 or email us at swansea@new-directions.co.uk.